A while back, the amazing people over at Scholastic asked me if I wanted a proof copy of a book that I had heard nothing about. I happily said yes, and then I was asked if I wanted to be part of the blog tour. Again, I happily accepted! 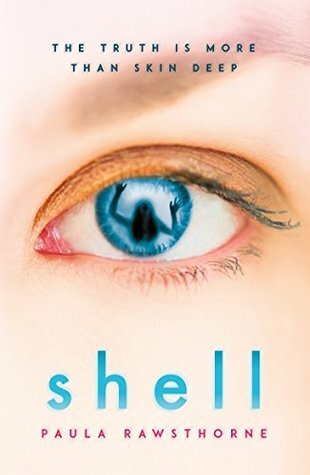 Shell: thrilling, gripping and a little bit freaky! Imagine that, just for a minute, you thought you died, but lo and behold, no. You’re alive. The jubilation at being alive, but then realising you are in fact in someone else’s body, living in their body, with your memories and your thoughts. When I heard this… I was taken aback and reading this book I was thrilled, but I was also a little bit freaked out! Initially, besides being freaked out by the thought of being me in someone else’s body, I found Lucy a little bit hard to like (I think she’s difficult and hard to reach at times) BUT she completely comes through as a likeable character. She’s flawed, which makes her a lot more relatable, and I definitely grew to like her a lot more throughout the book. You realise some of the decisions she makes, some of the things she does could have justifiable reasons behind them. Knowing Lucy’s story definitely justifies some of her behaviour. There’s some quite challenging themes in this book – life, death, memory, friendship, family, our willingness to do things for those we love – and I found that was one of the things that kept me coming back to this book. It challenged my own thoughts and feelings towards the characters, the story and also, made me think what would I do? (I would not like to be in Lucy’s place, or her parents’ place!) There’s a lot of struggle through this book – not from me, but from the characters. I definitely found myself pretty emotionally invested by the end, it was a lot. Building on the challenging themes, there are some interesting twists and turns… I’m RUBBISH at seeing twists and turns, so when they came along I was SMACKED in the face with them! I don’t do surprises well, but the brilliant story line, along with some great pace, plus characters I rooted for by the end, I was game for all of the twists and turns. They definitely kept me on my toes! It’s pretty grim and dark at times this book… but don’t let this put you off reading it. It’s gripping in its darkness. Also, can we just take a moment to appreciate that cover? HOW FREAKY IS THAT EYE MAN? 2018 marks the 200th anniversary of Mary Shelley’s Frankenstein, and this book is an ode to that story! Definitely an interesting spin on the original idea. Now that I’ve read Shell, I am definitely interested in reading Frankenstein! Happy birthday! How do you think you’d cope in someone else’s body? Whose life would you like to live for a day? Check out the rest of this blog tour! There are some amazing other reviews (worded much better than mine!) and some interesting posts!